Brian Haughton.com Crystal Skulls - Ancient artefacts or Modern Forgeries? On the death of Mitchell-Hedges in 1959, the skull was passed onto his adopted daughter Anna, and it remained in her possession until 1964, when she loaned it to family friends and art conservators Frank and Mabel Dorland to make a detailed scientific study. When not being studied the skull was kept in a bank vault for security, but on one occasion when the couple took the object home and placed it close to the fire, they noticed the amazing optical effects produced by the skull when light was shone through it. Some stories also mention poltergeist activity taking place whilst the skull remained in the house. In 1970, Frank Dorland apparently took the skull to the Hewlett Packard Laboratories at Santa Clara, California, at that time one of the world-leaders in electronics, computers and electronic quartz technology. After testing the skull Hewlett Packard Laboratories stated that they could find no microscopic marks on the crystal which would indicate it had been worked with metal instruments. Apparently the Lab also stated that the skull had been carved against the natural grain of the crystal, and were at a loss to know why it hadn’t shattered during manufacture. From this Dorland concluded that the original quartz block must have been first chiselled into a rough shape, possibly using diamonds, before grinding and polishing with water and sand. This painstakingly slow job would, according to Dorland, have required up to 300 years to complete, doubling Mitchell-Hedges already exaggerated claims for the creation of the object, and involving manufacture over several generations. However, there is no evidence at all for such sensational results at Hewlett Packard Laboratories. All that the lab tests in fact discovered was that the Skull was fashioned from a single crystal of quartz, nothing more. The rest is fiction. The mystery surrounding the provenance of the Skull of Doom and how it was manufactured have convinced many that a superhuman agency must have been at work. Perhaps the crystal is in fact 36,000 years old and was left behind after the destruction of the lost land of Lemuria? Or maybe Atlantis? F.A. Mitchell Hedges seems to have believed so. His daughter Anna herself believed the Skull original came from another planet and was kept in Atlantis before being brought to the Mayan site of Luubantun. A number of people have used the Skull for scrying (using a crystal or a pool of water to induce visions) and have reportedly had detailed visions of ancient civilisations. Others have noted the spontaneous appearance and disappearance of strange colours inside the crystal, or even holographic images. Weird sounds and poltergeist activity have also been associated with the Skull, and a number of people have testified to its magical and healing powers. 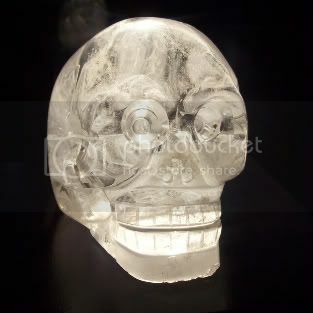 Believers in the magical powers of the crystal skulls cite a ‘Native American legend’ which tells of 13 ancient crystal skulls with moveable jaws, which are able to speak or sing. According to this legend, when all thirteen are found and brought together their collective wisdom, which includes the true purpose and destiny of mankind, will be made available to the world. Many are convinced that the Skull of Doom is one of the Sacred Thirteen. It is a romantic and exciting Indiana-Jones type legend, but in the avalanche of literature about crystal skulls there is not a single source for this ‘Native American legend’, which indicates that it probably never existed in the first place. Over the years Anna Mitchell-Hedges toured several cities in the U.S. with the skull, charging an admission fee to see and touch the famous artefact. She always maintained that she and her father found the skull in Lubaantun and claimed that after the expedition F.A. Mitchell-Hedges had placed the skull with Burney as security for a loan. When her father realized that Burney was attempting to sell the crystal he immediately bought it back. Although the Mitchell-Hedges skull appears much more life-like than the generally stylized art of pre-Columbian South America, it is believed by many researchers that the skull is of Aztec or Mayan origin, due to the importance of the skull in their iconography and known examples of Aztec rock crystal work. If it is Aztec, the Skull may have been used as a speaking oracle, with the separate jaw attached to the head using wire and perhaps operated by a priest to give the impression that it was speaking. With the crystal reflecting the light of a fire lit behind it this would have been an uncanny spectacle. However, there is no evidence of the Mitchell-Hedges Skull, or any other crystal skull, having being found on a South American archaeological site. But the intriguing tale of the Skull of Doom does not end there. When the Mitchell-Hedges skull was first studied in 1936, another crystal skull, known simply as ‘The British Museum Skull’, was used alongside it for comparison. This crystal had been obtained in 1897 from Tiffany’s, the New York jewelers, and was thought to be of Aztec origin. The study was made by anthropologist Dr. G.M. Morant, who found that the two skulls were dissimilar in one or two ways, for instance the British Museum skull was made in one piece, without a detachable jaw, and the ‘Burney Skull’ (which is how the anthropologist refers to the Mitchell-Hedges skull) was much more lifelike and finely detailed than the other. However, in the conclusion of his study of the two crystal skulls, Dr.G.M. Morant states ‘it is safe to conclude that they are representations of the same human skull, though one may have been copied from the other.’ He believed that, because it showed more anatomical detail, the Burney Skull was the earlier of the two and had been modelled on a woman’s skull. In January 2005 came the sensational news that after an extensive series of tests on the British Museum ‘Aztec’ skull, using a scanning electron microscope, a team of researchers from the British Museum concluded that the artefact was in fact manufactured in the 19th century, probably in Germany. The investigations showed markings on the crystal characteristic of jeweller’s equipment not developed until the 19th century, and it is now believed that the skull was created for the French collector Eugene Boban who subsequently sold it to Tiffany’s. Boban was a dealer in antiques in Mexico City between 1860 and 1880, and seems to have obtained his skulls from somewhere in Germany. In 1992 the Smithsonian Institution received a crystal skull from an unnamed person who claimed that it was Aztec and had been purchased in Mexico City in 1960. However, research at the Smithsonian revealed that the carving had been done by a wheel, or a rotary saw, tools which no pre-Columbian carvers possessed. Researcher Jane MacLaren Walsh, of the Smithsonian, discovered documents that proved Boban was the source of this skull. Not only this, but further research found that Boban had also provided several other supposedly ancient crystal skulls, some of which had ended up in various museums, including an ‘Aztec’ skull formerly in Paris in the Musee de l’Homme, now in held in the Trocadero Museum in Paris. All of these skulls were actually manufactured in Germany between 1867 and 1886. While the presence of 19th century fake crystal skulls does not necessarily affect the genuineness of the Skull of Doom, it does cast doubt on the supposed ancient origins of the number of untested crystal skulls which currently exist around the world, mostly in private collections. Many researchers wondered why Anna Mitchell-Hedges refused to submit her crystal skull for scanning electron microscope testing, which although it would not provide an exact date for the object (all crystal is ancient and there are no methods for dating it), it would surely prove whether this enigmatic artefact was of Mayan or Aztec origin, or something much more modern. Anna Mitchell-Hedge died in April 2007 and the Skull of Doom is now in the possession of her husband Bill Homann, who runs a website “dedicated to sharing his message as well as the Mitchell-Hedges Crystal skull with the world at large”. Morant, G.M. ‘A Morphological Comparison of Two Crystal Skulls.’ Man 36 (July 1936): 105-107. Morton, C. & Thomas, C.L. The Mystery of the Crystal Skulls. Thorsons. 1997. Nickell, J. & Fischer, J.F. Secrets of the Supernatural: Investigating the World’s Occult Mysteries. Prometheus Books UK. 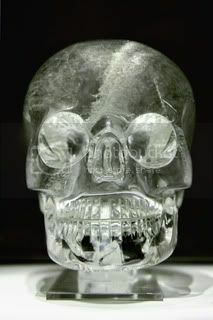 1991.
http://www.sgallery.net/news/01_2005/09.php Article about British Museum crystal skull being proved a fake. http://www.unmuseum.org/cryskull.htm Unmuseum article on the Crystal Skulls. Powered by WordPress v 4.9.10. Page in 0.216 seconds.